Chiropractic and Posture: What's the Big Deal? Posture is the window to health? What’s the big deal? Why is my Chiropractor so interested in how straight up I look? Truth be told, it’s way more than just how you look. Posture can tell a great deal as to how well you function. Walk through an exercise with me. I want you to sit in “perfect” posture. Sitting as tall as you can, head above your shoulders. Now turn you head to the right and left and notice how it feels. Ok. Now try it again, but this time I want you to jut your chin out in front you. Notice a difference? Of course you did. 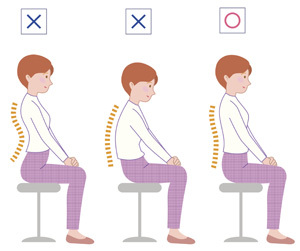 Changing your posture changes the way your spine is able to move and position itself. It’s important to understand that the spine is much more than just a sack of bones, ligaments, and muscles. It’s the protective housing for your Central Nervous System, which consists of your brain, spinal cord, and the nerves that exit from the spine. Your central nervous system controls and coordinates function of your entire body. Changes in the posture of your spine, can adversely affect the function of your central nervous system. This in turn can cause a wide variety of health concerns. When the spine doesn’t move correctly and gets “stuck” in an abnormal position, this creates tension and stress and the delicate nerves that exit from the spine, connecting brain to body. This can also leave your body more susceptible to stress. Stress comes in many different forms such as physical (car accidents, falls, posture), chemical (diet, toxins, environment), and emotional (work, relationships, loss). When your central nervous system is adversely affected, it doesn’t allow your body to deal well with stress very well. This can leave you feeling more stressed, worn down, tired, achy, etc. When stress builds up in your body, it takes a toll. It can affect your muscles, mood, and even your vital organs, which are supplied by nerves that exit the spine. All organs need optimal connection to the brain to be able to function properly. Have you had your spine and nervous system checked with a complete examination recently? If not, contact us or give us a call at (805) 379-3653.